This cemetery is within the Old Cairo cemetery area, which is situated approximately 5 kilometres south east of the centre of Cairo. The cemetery area is on the south side of the road Salah Salem, which runs west/east from the River Nile towards the green park area approximately 2 kilometres beyond and eventually towards the Citadel. The cemetery is surrounded by a high wall and the double entrance gates are along Sharia Abu Safein. This road is parallel with the railway line which runs south from Cairo main station and both railway and Sharia Abu Safein cross over the main road. Access up to Sharia Abu Safein is by using the northside ramp above the main road underpass, on the east side of the railway. General Headquarters, Middle East Command, was set up in Cairo shortly before the Second World War, remaining there throughout the war years. In January 1941, a Royal Air Force Sector Headquarters for Fighter Defence Canal Zone was established. Cairo was again a significant hospital centre during the Second World War. 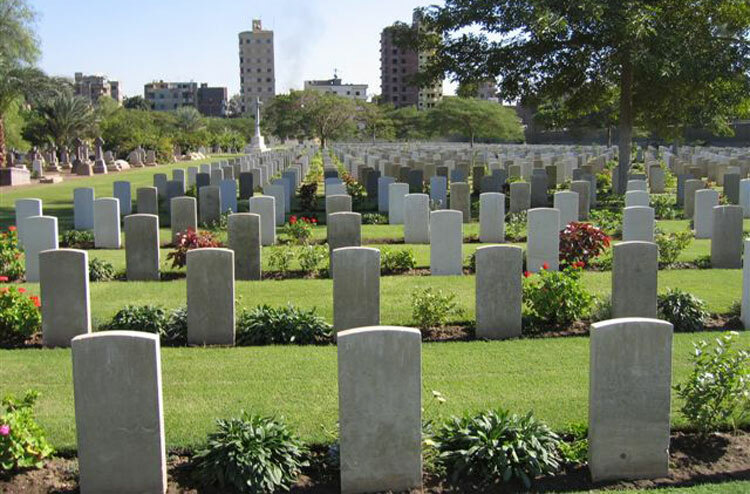 Cairo War Memorial Cemetery was formerly part of the New British Protestant Cemetery, but plots B, D, F, H, K, M, O, P and Q were ceded to the Commission in 1920. Some graves were brought into these plots from elsewhere in the Protestant cemetery and in 1960, 85 First World War graves were concentrated from Minia War Cemetery, 200 km south of Cairo, where maintenance could not be assured. One burial of the Second World War was also moved later from Old Cairo Old Latin Cemetery for the same reason. There are now 2,056 Commonwealth casualties of the First World War and 340 from the Second World War buried or commemorated in the cemetery. A small number, known to have been buried in other civil cemeteries in Cairo but whose graves are now lost, are commemorated by special memorial. Burials in the following civil cemeteries are now alternatively commemorated in Cairo War Memorial Cemetery: Cairo (Basatin) Jewish Cemetery Old Cairo Jewish Cemetery Cairo Maronite Cemetery Cairo Civil International Cemetery Old Cairo New Latin Cemetery.